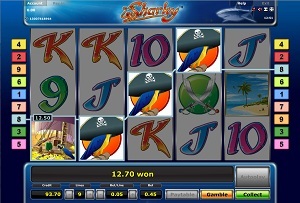 Join the Sharky slot on the Caribbean seas and try to find your fortune among sharks, parrots and treasure chests. The compass will guide you and if you hit the Ship symbol on the 1st reel and the Island symbol on the 5th, you will trigger the free spin feature and head for land. This Novomatic slot machine is a remarkable adventure with one of the most unique free spin features on the market. Graphics & Appearance: The Sharky slot machine from Novomatic has a great piracy theme which is represented in all symbols and features. The game window is designed in a deep blue colour and all symbols and buttons are clearly visible and easy to tell apart. The music and sound effects in Sharky is your classic slot effects except in the bonus feature where the sound of the rowing pirate puts an exciting touch to it. Gamble Feature: As soon as you have hit a spin win, you will have the option to gamble that win. The Gamble button, next to the Start button will be lit up and start blinking in yellow. To enter the gamble feature, simply click on the button. You will then be taken to the gamble window where your aim is to successfully predict the outcome of the next card that will be drawn from the deck. It’s a 50/50 chance; if you manage to pick the right colour, red or black, your spin win will be double and you can choose to gamble again or collect your winnings and return to the reels. Game Symbols: The highest paying symbol is the Wild – the Pirate. This symbol will substitute for all symbols except for the scatters – the Ship, the Compass and the Island symbols. You will also see symbols like the Parrot, Treasure Chest (surprise), a Compass and some Swords. The lower paying symbols are 10, Jack, Queen, King and Ace. Bonus Feature: The free spin feature in this slot machine is a very fun and exciting bonus feature in comparison to most other slot machines. If you hit the Ship symbol on the 1st reel and the Island symbol on the 5th reel, the free spin feature will be activated. The Pirate symbol will leave his ship and enter a small rowing boat and start rowing towards the Island ( you will actually see the Pirate row across the 5 reels ). On his way, the Pirate will be able to find treasures in the Treasure Chest that might appear on any of the reels. The bonus feature can be re-triggered while you are playing the feature. Betting Options: Sharky offer you to play with 9 paylines over 5 reels. You way set your payline and stake preference by using the + and – buttons that are located in the lower part of the game window. Game Features: You can use the Autoplay function while playing this slot machine. To activate the function, click on the Autoplay button located above the Start button in the lower right corner of the game window. If you wish to stop the Autoplay function, the same button will stop it if you click on it again. Please note that the gamble feature will not be accessible if you are using the Autoplay function but the free spin/bonus feature will of course be available. « More slotmachines guides Article last updated: Wednesday, June 15, 2011.